We have an multi-level office building, mabye 20,000 sq/ft, and a problem with scabies. Several people now have been diagnosed and they work on two different floors. A lot of the staff is worried we’re having some kind of outbreak and need to do something. We use a pest service for general pests but they don’t handle mite problems or treatments so we want to do something ourselves. 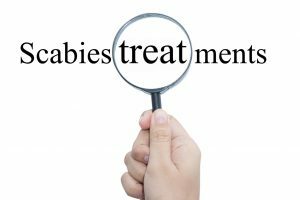 Do you have a treatment for scabies? What do you recommend? The doctors we consulted with said the scabies is what happens when the mites get on people but they’re not able to tel us if the mites are coming from our building. So far 4 people have the problem. Its important to understand that “scabies”, as it pertains to people, is just that: a skin condition typically diagnosed by a dermatologist and caused by mites. The mites cause the discomfort and itching because they either bit the victim or they burrowed down alongside hair follicles under the skin. When enough bites or burrowing occurs, an itchy rash can develop. In most cased, skin ointments can be applied to kill the mites living under the skin. If the infesting mite is a true scabies mite, treating the skin will be important to end the discomfort and to prevent the mites from spreading to others. In cases where the itch is due to a reaction from the mite bites, treating the environments where the victim is active could be important. This will ensure the problem doesn’t spread. In general, some people tend to be more sensitive to bites or burrowing. Its like food allergy; some people may be fine with a minor issue and never know its happening but for others, just a few invasive mites can cause uncomfortable skin problems. To complicate matters, to find the true “source” can be complicated. For a long time, it was thought the offending mite could only live on people and in general, this is true. But there are many mites which can cause similar issues and most of these can live most anywhere. So if the mite causing the scabies like condition is not the true scabies mite, treating more than just the skin of the victim is a valid way to deal with a local outbreak. 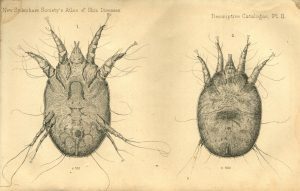 Given how people react to mite bites and related burrowing, its entirely conceivable for someone to pick up some a mite at their home from a pet or other family member. This mite could then be brought to their place of employment. Its also possible this person didn’t have a reaction to the mite so they had no clue they were even carrying it. But once they got to work around the office, some of the mites fell onto desks, appliances, computer keyboards, etc. From there, the mites spread to others using these appliances. And if any of the staff that picked up some of the mites has a reaction, well, you can understand how a problem can rapidly develop. Male and female scab mites which cause skin scabs on animals like sheep. From “A Descriptive Catalogue of the New Sydenham Society’s Atlas of Portraits of Diseases of the Skin”. Published by the New Sydenham Society, London, in 1869. Author: Sir Jonathan Hutchinson. The most common mite that causes scabies is the Sarcoptes scabiei. 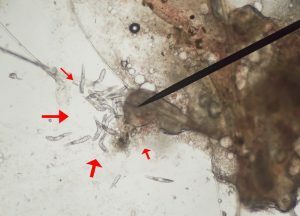 But others have been found to cause similar reactions including the animal scab mite (commonly found on horses, sheep, dogs and more), demodex mite (also known as the face mite), STRAW ITCH MITES, mange mites, CHIGGERS, BIRD MITES and OAK ITCH MITES. 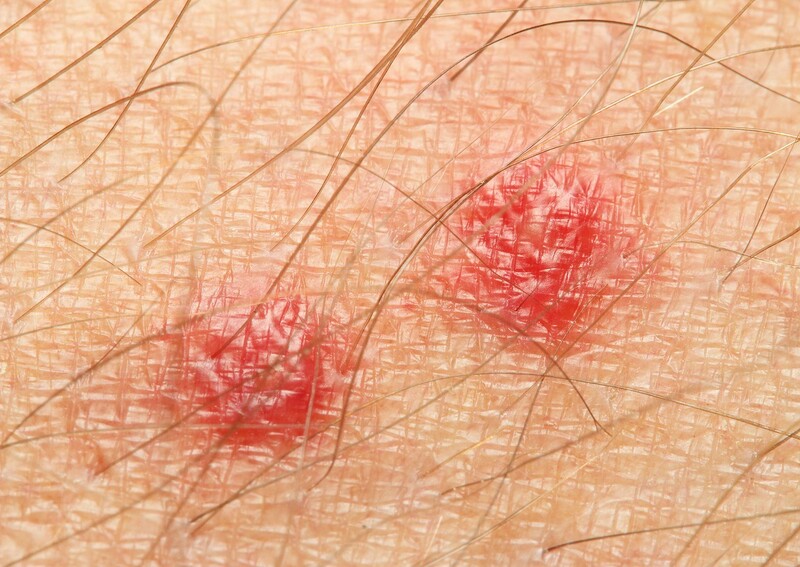 Some people can have similar scabies like reactions to common pests like CLOVER MITES or CHIGGERS. These arachnids are not viewed in the same light as a true mite but they are closely related. In all cases its hard to differentiate the true cause (which mite) may be responsible for the problem. Regardless of which it might be, the glaring problem is usually best defined by the impact on the patients skin. For this reason, its probably smart to do some form of treatment. This will ensure the problem doesn’t spread. True, the smaller microscopic mites don’t live long once they fall off or migrate away from their host. But if the environment where they fall is occupied by others, they can spread. So how can you treat your building given the “rash” of scabies outbreaks? There are a few options. The “easiest” treatment is to lightly “mist” over common areas employees use with FLYING INSECT KILLER. 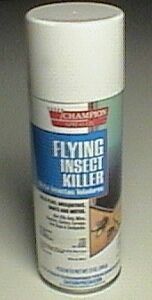 Generally used as a space spray for pests like gnats or mosquitoes, Flying Insect killer is also labeled for mites. You can lightly mist over desktops, appliances, chairs and carpets. One can will cover up to 2,000 sq/ft. Since your building is quite large, treating it with aerosol cans will take a lot of time and ultimately, cost more compared to using a mixture you create and spray or fog. So if you prefer to spray a liquid over carpeting and furniture, use ONSLAUGHT. This mixes with water at a rate of .5 or 1.0 oz per gallon of water used to treat 1,000 sq/ft of surface area. Onslaught is labeled for mites and is strong enough to handle that might be active in the building. Use a good PUMP SPRAYER to apply the mixture and retreat in two weeks to ensure the problem is controlled. 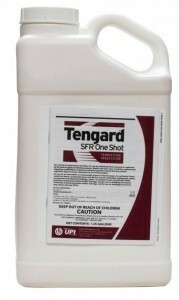 Another active that will work on a range of mites is TENGARD. This active can be sprayed like Onslaught but can also be fogged. This is the best way to apply it since the fog goes a long way and won’t over apply the product needed to get the job done. Plus its easier to use when treating large open areas. Mix 1 oz of Tengard per gallon of water and when liquid spraying, plan on getting 1,000 sq/ft of coverage per gallon. When fogging, you’ll use less mixed material to get all the surfaces covered. And you can do so in a fraction of time. 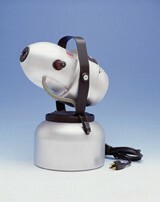 The MINI FOGGER is suitable for most homes and can handle structures measuring 5,000 sq/ft or less. 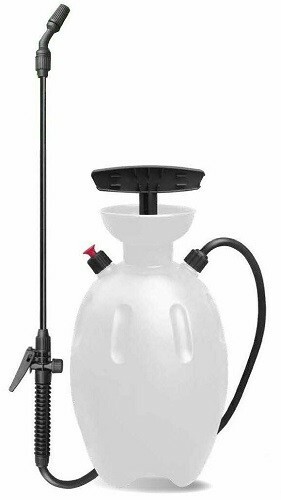 It features a 32 oz holding tank for mixed solution and is powered by electricity. But for a structure larger than 5,000 sq/ft, go with the FM6208. This features a volume control so you can mist a light to heavy fog. It has a one gallon holding tank and is powered by electricity too. If you plan on treating rooms with sensitive equipment or furniture, use the ULV model FM7401. It will produce a super fine fog because it generates super small micron sized particles. This ensures you won’t over apply the mixture. It too runs on electricity and has a 1 gallon holding tank.